The current bubble in the number of people attending college is mostly the result of government-backed student loans. In an effort to make college education more affordable, Congress passed a bill in 2007 to temporarily reduce the interest rate for federally subsidized loans to 3.4 percent. This law is set to expire at the end of June, but the Obama administration now wants to extend the cut in interest rates. In addition, the administration effectively federalized student loans in March 2010 when President Obama signed legislation to expand college access. Under the measure, private banks would no longer receive fees for acting as intermediaries in federal student loans. The government would use these savings to increase Pell Grants to make it easier for students to pay back their loans. 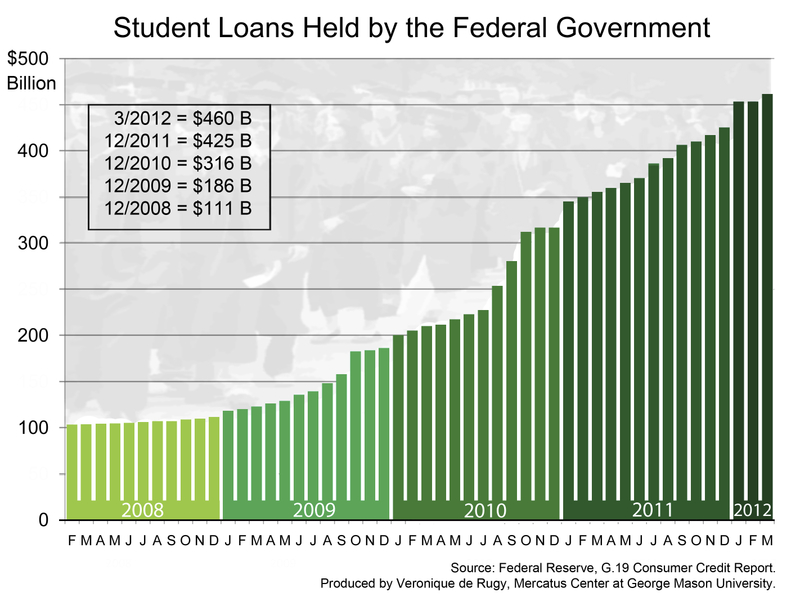 Using data from the Federal Reserve, this week’s chart shows a dramatic three-fold increase in the number of student loans held by the federal government in the past four years alone. 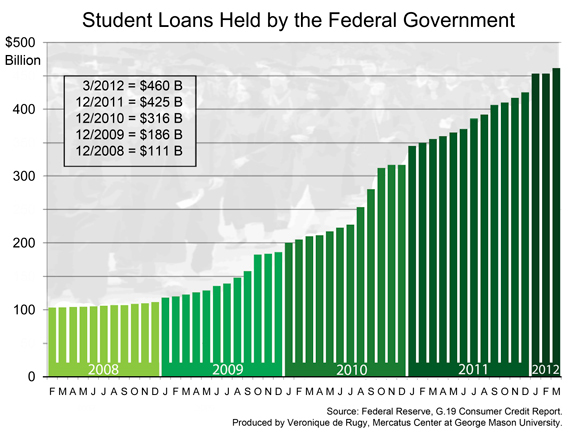 When the law was passed in 2007, student loans held by the government totaled about $100 billion. The loans increased to $111 billion in 2008; $186 billion in 2009; $316 billion in 2010; and $425 billion in 2011. In 2008 the interest rate was 6.8 percent and was reduced in stages over the next four years to 3.4 percent. The data show a notable rise in the number of loans taken out between July 2009 and July 2010, when the interest rate was reduced to 5.6 percent. A similar spike is apparent in the July months of the following years. We also see a noticeable change shortly after the adoption in March 2010 of a law to overhaul student loan programs, which has effectively run private banks out of the student-loan business. Historically, federal loan programs have been the main source of federal credit assistance for higher education. Since the recession hit, private lending has remained stagnant, growing at a much slower pace. According to the Congressional Budget Office, the size of the private student loan market was about $22 billion in the 2007-2008 academic year, implying that the private market was about one-quarter the size (by dollar value) of the market for federal student lending. According to the Wall Street Journal, non-revolving consumer lending by commercial banks (privately held) — a measure tracked by the Federal Reserve that includes student loans as well as auto and other personal credit — is up less than 11 percent since December 2007. Over the same period, total consumer loans owned by the federal government — a measure that includes loans originated by the Department of Education under the Federal Direct Loan Program — has more than quadrupled.